On the auspicious occasion of International Yoga Day, Vivekananda Kendra Kanyakumari Kolkata Mahanagar organised International Yoga Day Celebration at IIM KOLKATA. It was conducted by Prant Vyavastha SahPramukh Dr.Arun Upadhyay with Vivekananda Nagar's Sampark Pramukh Shri Ramesh Mundra, Vistaar Pramukh of Hatibagan Smt.Sarita Sehgal, Sanskar Varg Pramukh Manish Pandey, Malda Vistar Sampark Pramukh Ku.Malti, Shalimar Vistaar Pramukh Ku.Shubhangi Upadhyay. We are happy and obliged to present you the report of various activities conducted by our Vivekananda Kendra Rural Development Programme. VishwaBhanu is a Bi-monthly bulletin of Vivekananda Kendra Vedic Vision Foundation. We are happy to release the April-May 2016 issue, this issue covers report of Personality Development Camp held from 1st to 7th April 2016 with 57children and another non-residential Personality Development Camp held from 13 to 19th April 2016 with children age of 11 to 17 studding in class 3 to 5, a glimpse of Vimarsha on "Ramayana" and Samskar Varg Prashikshan Shibir held at VKVVF with regular activities like Weekly Ayurvedic Camp, Yoga Satra & Varga, Swadhyay Varg on Bhagavad Gita, Samskar Varg, etc. 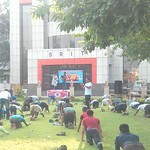 Along with the rest of the country, Guwahati also celebrated the second International Day of Yoga today. 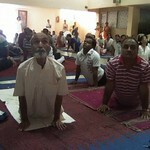 Yoga enthusiasts, young and old alike, took part in various yoga sessions organised by different bodies. In the city, the Vivekananda Kendra Institute of Culture (VKIC) and its branches conducted yoga sessions in more than 25 places, including government offices, educational institutions and media houses throughout the day. 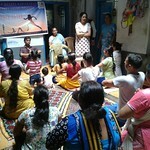 Around 50 yoga trainers and volunteers were engaged by the Kendra to impart lessons and oversee the proceedings in different locations. Janardan Das of the VKIC said that the response has been overwhelming across the city and people from various sections of the society and different age groups took part in the yoga sessions. 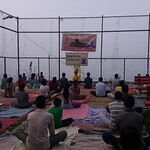 Among the places where VKIC volunteers conducted yoga sessions since early morning include VKIC, Uzanbazar, VKIC, Panbazar, Ambikagiri Nagar, Barthakur Mill Road, Cotton College, Cotton College State University, Tata Institute of Social Sciences, Office of the Archaeological Survey of India, Panchayat and Rural Development department, Office of the Accountant General, Gauhati University, Handique Girls’ College, IGNOU Regional Centre, Reserve Bank of India, Institute of Advanced Studies in Science and Technology, Regional Science Museum, Doordarshan Kendra, Guwahati, Gyan Educational Institution, Kahilipara Bengali High School, Bharat Seva Ashram, Food Corporation of India and Indian Institute of Information Technology. “I simply want to be like the squirrel in the building of Râma's bridge, who was quite content to put on the bridge his little quota of sand-dust. That is my position”. Blessed is the little squirrel; he is doing his work to the best of his ability ………… said Sri Rama, we too are working to the best of our ability to fulfill the dream of “Green Rameswaram” project. 1. Shri.Narendra Joshi in his blog tells us how the epic Ramayana is deeply rooted in the land as well as in the minds of Indians. 2. Hand in Hand India showcases the work done with the support of ONGC at Rameshwaram along with the photographs of the Mass cleaning campaign. 3. C.P.Ramaswami Iyer Foundation shares the knowledge of Nakshtra Vanam which they have established at ‘Mangal Vanam’ as part of ‘Green Rameswaram’ project. This month, they are writing about “Poison Nut Tree” which is associated with “Aswini Nakshtra”. 4. Vivekananda Kendra – Nardep highlights the ‘Why and How’ of Renovation of Water bodies along with the photos of the newly renovated ‘Narana Teertham.’ And finally the most important Social Engineering by involving the community in spreading idea of Swacha Bharat. Click here for this month’s newsletter. Aanandalaya Acharya Prashikshan Shivir - 13-18 May 2016 - at Jettu Ashramam, Parvathipuram, Vizianagaram district. ning for Tribal Upliftment) Trust and Kum.Padmaja, Secretary, JATTU Ashramam, gave inspiring messages to the participants in the concluding in which Aadarneeya Varsha Didi also spoke. Aanandalaya Acharya Prashikshan Shivir, 20-25 May 2016, at Aaditya Degree College, Nellore. Participants: total 4 [2 from fishing community of Prakasam district and 2 karyakartas from Kadapa]. Acharya Aaditya, founder of the college and Nagar Sanchalak, Vivekananda Kendra, Nellore, spoke in the concluding ceremony. The chief resource persons in both the Shibirs were Aadarneeya Varsha Didi, VK Odisha Praant; Kum Binoti Sawra and Sri Ajay Sawra from VK Assam Praant. Shri PVS Karthik Kumar, Asmita Sanyojak, VK Telugu Praant was the Shibir Pramukh. Sri CA Prasad, Jana Vignyana Kendram inspired the participants in both the Shivirs to inculcate language abilities through action songs. Sri Sannyasi Rao, resource person of the Jettu Ashramam's educational intervention took a session at Parvathipuram on how to introduce 'aksharas' amongst children. 3rd Praant sthariya - Karyakarta Prashikshan Shivir: 28 May-3 June 2016 at VK Kaushalam, Hyderabad. Participants 4 - [3 from Kadapa and 1 from Vijayawada]. Organising team: 4. Sri Chandramouli, Praant Pramukh, Telugu Praant inaugurated the Shivir; Sri CV Prasanna, Saha Praant Pramukh, Telugu Praant spoke on during the conclusion. 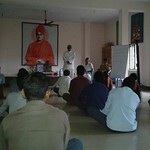 Sessions were taken by Justice CV Ramulu, Praant Pramukh, Sri Mahesh, Member, VK Kaushalam Samiti, Sri Bhaskar Sharma. Sri PVS Karthik, Sri Deepak Khaire and Sri Prabhu Chaitanya, etc. Sri Vivek Bharath co-ordinated all the Karyapaddhati sessions. Chandanotsav - 1 June 2016: Sri Vivek Bharath, Warangal, decided to join the Vivekananda Kendra as Shiksharthi. Prior to his leaving for Kanyakumari a special ceremony was organised at VK Kaushalam in which Aikya Mantra was chanted and its vision explained; relevant portions of Taittiriya Upanishad - Shikshavalli was chanted while Sri Bharath assented to the core aspects that he will nurture. Sri Bhaskar Sharma, Praant Vyavastha Pramukh purified the offerings through the chanting of Purusha Sukta. Justice CV Ramulu, Telugu Praant Sanchalak said that after 20 years, a karyakarta is setting out on the path of Jeevanvrati from a praant which at one time used to send such regularly. Sri Vivek Bharath shared how Mananeeya Nivedita Didi's talks during Rashtra KPS made him make up his mind to dedicate himself for this cause. Members of the Praant Samiti, Hyderabad Vibhag Samiti and Nagole and Dilsukhnagar Nagar Samitis were present on the occasion to bless Sri Bharath on the Spiritual journey ahead. 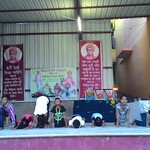 Maharashtra Prant of Vivekananda Kendra Kanyakumari conducted a Yoga Shiksha Shibir at 'Prashikshan va Seva Prakalpa', Pimplad. Pimplad is near Shri Kshetra Tryambakeshwar situated in Nasik district from 15/05/2016 to 30/05/2016. 30 people participated from all over the state and 1 was from Gujarat. er session of 'Preranetun Punarutthan' comprising of action songs, games, claps and sharing of various experiences of the karyakartas while working in different parts of the country. 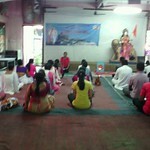 Concluding function took place in pre-lunch session on 30th May. 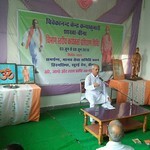 Mananiya Shri Bhanudasji, all India General Secretary and Ma. Shri Abhayji Bapat, Maharashtra Pranta Pramukh addressed the participants and distributed the certificates. This month’s newsletter is short as we are having a separate letter for our ‘Green Rameswaram’ project. This month Tenali Raman is expressing his wisdom in the field of ‘Industry and Environment’. In our happenings section, we have covered training on Bio-manure, Terrace gardening, Shelter and Bio-methanation plant. Our Green Health Home which gives herbal medicines continues to attract patients although Vivekananda Kendra is having a regular allopathic dispensary in the campus. In the wisdom section, we have S.A.R.Acharya, Former Director, Vishvaneedam, International Sarvodaya Centre, Bangalore writing on the “British Legacy in the field of Dairy”, Napoleon Wolasinki, Former Head of the Dept. of Ecology, Polish Academy of Science, Poland writing on the “So called Development” and finally Dr.S.B.Verma, Scholar, Thinker and Writer from Delhi showing the “True path of Development” on the lines of HM.Jigme Singye Wangchuk of Bhutan. 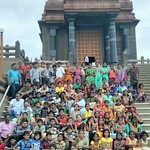 Veera Narendra Panpaatu Mugaam for village children of Kanniyakumari district at Vivekananda Kendram Kanniyakumari from 25th to 29th May 2016. 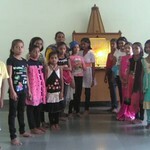 There were 97children of 4th standard onwards participated. Matrupooja was organized in the concluding session. There were 60 parent participated in concluding session. 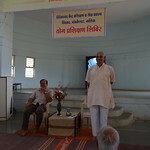 Camp was concluded by the bessing of Vidhyapuri Mathaji, ShradaAshram, Nettankode and Swami Chaitanyananda Maharaj, Vellimalai Ashram gave his blessings.